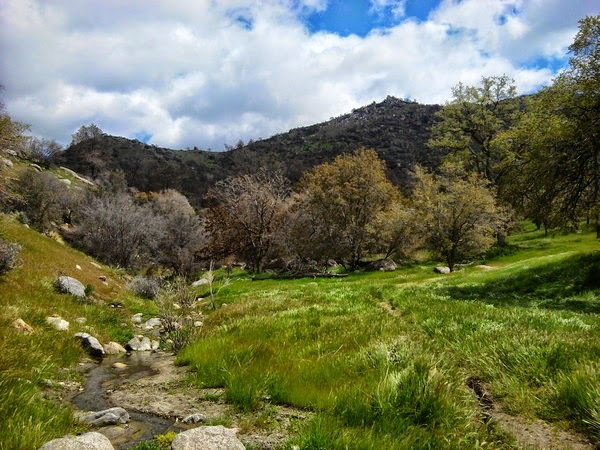 If you are looking for a great Spring camping spot, a hot spring, and a quick 7 mile round-trip hike with beautiful views, Hobo Campground and Remington Hot Springs. Hobo campground is a small campground located off the 214. As of 2011, this was not on the map yet and we had to rely on directions from a previous scouting that one of the other members did the week prior. Since it is first come, first serve we arrived there early. This site may be more popular then it used to be now that it is visible on Google Maps. We met in the town of Lake Isabella and traveled southwest until we saw signs for Hobo Campground. Remington Hot Springs were also hard to find, but are on the map now. The Trailhead is right across the street from the parking lot and easy to see. You will need two permits - a fire permit and a car permit as well for your parking. Be prepared for the necessary warmth in sleeping, wood for the fire, and bathing suit for the springs. While the springs will be warm, you will be very cold before and after you get in, so be sure to bring a warm towel. No need to worry about weight or how you will carry the towel since you will need to park near the springs. The next morning after breakfast, we packed up for a day hike and packed our bathing suits. We drove down to the parking lot of the Remington Hot Springs. After a short hike, we arrived at three "hot tubs." It looked as if these hot tubs were built with cement while the Kern River was low, complete with random tiles pushed into the cement. The Kern was running alongside the tubs had to be about 40C with a very strong current from the snow melt. The hot tubs reminded me of Goldilocks and the Three Bears. One was flooded with frigid water, one was about 80 degrees with a partial flood, and the last was a toasty 90+ degrees. The temperature outside was probably ~50-55F, so we waited until one of the groups left, shed our jackets and slid in. Being the only one that was non-Californian native, I enjoyed was a bit more comfortable with the cold water. Jumping into the Kern at 40 degrees, then back into 90 degree water was probably not the best thing for my heart, but it felt great. The other group in the tub were Russian, clearly drunk from beer and Vodka in an unmarked bottle. They also had not packed their bathings suits (or didn't believe they were necessary). One man, listening to people complain about the cold, stood up and made an announcement that would have met any stereotype from a bad 80's movie. In a thick Russian accent, he announced,"You Americans - you do not know cold. This is not cold!" and dove into the Kern to swim across. The Kern was strong, and at one point he panicked and tried to swim across. We were afraid we were going to have to jump in and fish out the naked man, but he made it cross and climbed the top of a rock. He faced us like a conqueror peering down above a fallen city. Aside of this spectacle, the tubs were pretty calm but busy. You had to rotate in and out, which meant 5 min or so of cold shivering and then back into the warm water. While this was nice, it got old and we decided to pack up and head up the Remington Ridge Trail. The Remington Ridge Trail is 3.63 one way, though you hike in and then turn around (see here for trip map). The total elevation gain is 2828, mostly through switchbacks. Once you arrive at the peak, you can continue for at least another 3-4 miles, but we decided to take a break for lunch, hike in another hour to get the best view, and then turn back around. The view from the top was amazing. 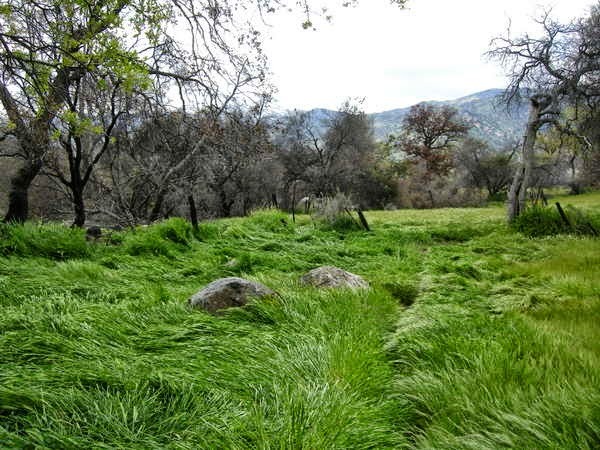 This was my first California hike, and I was amazed at the view of the mountain peaks, the vibrant green grass, and the granite stones pushing through the green. 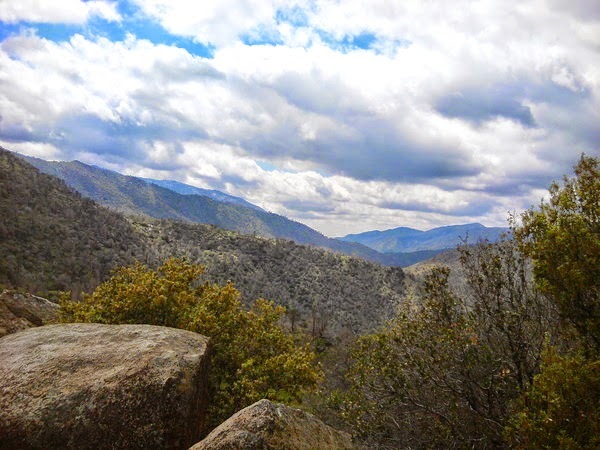 It was beautiful, and I didn't properly appreciate how much nicer these mountain ranges were because I had not yet hiked the dry Santa Monica Mountains, the California Desert, or the rocky San Bernadino landscape. Overall, the sites and the hike were very nice. The springs were something to experience, but I can imagine they get very busy at certain areas. I would highly recommend for a good car camping trip.